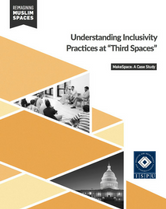 This fourth report in ISPU’s “Reimagining Muslim Spaces” series presents a case study of MakeSpace, an example of the recent Third Space phenomenon. Using MakeSpace as a case study, we examine how a Third Space is different from a traditional American mosque and what attracts participants to Third Spaces. Specifically, we examine how Third Spaces establish inclusivity practices that are considered to be an improvement on traditional mosques. In studying inclusivity practices, we focus on three key demographics: women, youth, and converts/ new Muslims.